It is likely that both BMSB and SWD will continue to expand their geographic ranges. Their presence will present a complication for vineyard management at harvest. However, the magnitude of this disruption is still unclear. Bolda et al. (2009) projected significant losses to Pacific Coast small fruit crops from SWD, particularly if trade barriers are erected. There will likely be greater pesticide use shortly before harvest of grapes and other fruits and vegetables. Pesticide efficacy trials are now underway in many locations and optimum choices for chemical control would be available in the near future. 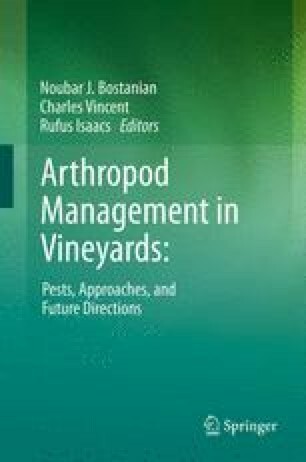 Currently there is cause for concern, because the pyrethroid class, providing some of the greatest mortality at this time, has extremely negative effects on vineyard IPM programs, potentially inducing secondary pest problems. Some of these pests (e.g., mealybugs, Chap. 12) are vectors of important grapevine diseases. Under a global warming scenario, it is likely that BMSB will become a greater problem, because of decreased winter mortality. Based on a Japanese study, each 1°C is expected to result in approximately 13.5–16.5% decrease of winter mortality (Musolin 2007). In addition, earlier spring emergence of BMSB has been seen because of higher early spring temperatures. The wide host range of BMSB and SWD will complicate control programs (Nielsen and Hamilton 2009a). Efforts may be needed at the landscape level. MALB has been present in vineyards for a longer period of time. It now seems that this insect will pose the greatest threat not from primary injury to berries, but by concentrating in clusters that are already injured by other organisms. In such situations, managers should be vigilant in order to protect wine quality.